AMERICAN AIRLINES THEATER, (ca. 1918) various murals, 229 West 42nd St., New York. BROOKS ATKINSON THEATER, (ca. 1926) various murals, 256 West 47th St., New York. 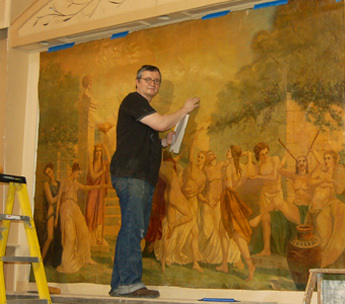 HARKNESS HOUSE, The Commonwealth Fund, ceiling murals , 1 East 75th Street, New York. STATE SUPREME COURT HOUSE, (1916), two murals, New Haven, CT. THE QUEST FOR KNOWLEDGE (1939) by Florence Lundgren, at Curtis High School, Staten Island, New York. Assistant. THE GRADUATE (1905) by E.H. Blashfield, City College University, New York. Assistant. ABSTRACTION (1939) by Ilya Bolotowsky, Goldwater Hospital, New York. Assistant.